You may already have policies in place to reduce the human and economic toll of crashes involving company-car drivers. 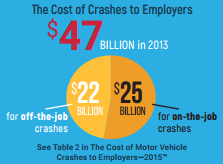 But did you know that the cost of off-the-job crashes is nearly as high? Off-the-job crashes are much more frequent. And, they involve employees and their dependents. 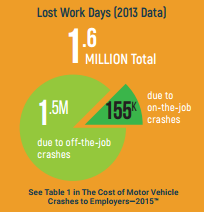 Lost work days due to motor vehicle crashes totaled more than 1.6 million in 2013. You might be surprised at how those days break down between on-the-job and off-the-job crashes. An off-the-job crash is any crash experienced by Nearly 90% of those work days are the result of off-the-job crashes. According to the National Highway Traffic Safety Administration (NHTSA), driver behavior is a factor in 94% of all motor vehicle crashes, meaning that nearly all of them are preventable. We also know from the recent NETS study that a portion of the overall costs of crashes can be broken down into types of driver behavior. In addition to the behaviors cited to the left, drowsy driving is a growing concern given our increasingly-connected 24/7 society. Efforts are needed to educate on the importance of quality sleep and to encourage healthy sleep habits, along with recognizing the signs when we are too drowsy to operate a motor vehicle safely. The encouraging news is employers are in a favorable position to help reduce crashes attributed to driver behavior, including drowsy driving, through education and training. Employers can collectively reach nearly 50% of the U.S. population—even more, when information is shared with employee family members—and employers have a captive audience. Take the time to ensure the work hours and expectations of management are such that the workplace is not contributing to unsafe driving behaviors. Keep in mind that road safety education of all employees is time well spent, with the potential to reduce crashes on and off the job. The above is an excerpt from the article,”Why Invest Time in Road Safety Education in the Workplace?” For more information, please visit nhtsa.gov.